The Alaska Bill of Sale Forms are legal documents that offer proof of the transfer of ownership with regard to vehicles, vessels or essentially any form of personal property, between two (2) parties. The bill of sale effectively describes the type of sale, trade or even gifting of the property. The transaction is made permanent upon at the time that the document is signed by the required parties and the items, whether monetary or traded have been delivered between the negotiating parties It is important that each member of the transaction be recognized with State or Federal identification and an original copy be provided to all parties. Any of these documents along with picture Identification, State or Federal, is what will be required for registration. ATV/Snowmachine Bill of Sale (Form 808) – For the sale or trade of any All Terrain Vehicles ATV or Snowmachine. Boat Bill of Sale – Proof of sale and purchase transaction for a boat/vessel – Registration will serve as a temporary license until a number is assigned. General Bill of Sale – To be used for the sale of any type of personal property sale. Gun/Firearm Bill of Sale – To be used for any type of firearm sale and purchase. 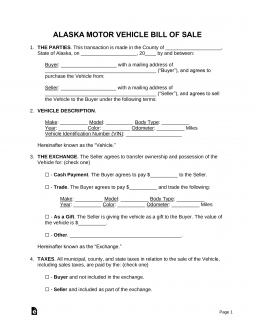 Motor Vehicle Bill of Sale – To use for the transfer of ownership -New owner has thirty (30) days from the date of purchase to register the vehicle in their name.